With only four weeks to go, I am torn between the excitement of graduation and the reality that I will be leaving the city and my students soon. That said, there is still work that has to be done before any of this can happen! So what has happened in room 222 this past week? The students returned from spring break refreshed and eager to share what they did while they were off for an entire week. More importantly however, they were excited and ready to finish out the year and move closer to being third graders. This was great for me as well because the students were very attentive as we went throughout the week. 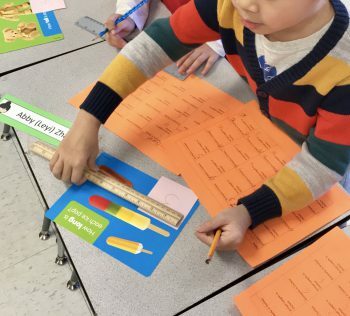 It has been measurement mania in our classroom, as we have been exploring the units of inches, feet, and yards. We created Measurement Monsters, which had students create monsters with different measurements. We also found the heights of one another along with objects in the classroom. The students also had fun creating their own fantasy writings. Prior to going on Spring Break, we were learning about the importance of taking care of the Earth, as Earth Day is approaching. 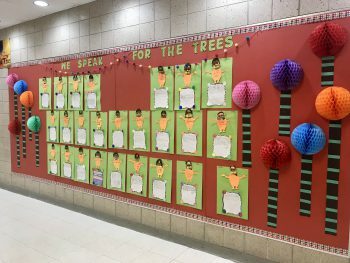 We read the book The Lorax and wrote how we would help the Lorax take care of the Earth. These writings are now posted on our bulletin board, which has brightened up the hallway. This week at Chicago Semester, we celebrated a fellow student teacher’s birthday. This is an example of how the program promotes supporting each other and creating an environment that feels like home. We were able to take time away from our work and enjoy each other’s company while having some ice cream treats. This comradery with fellow student teachers is something I value and feel contributes to my success here at Chicago Semester. I also got to participate in the Chicago Semester Visit day for those who are looking to come to Chicago Semester. 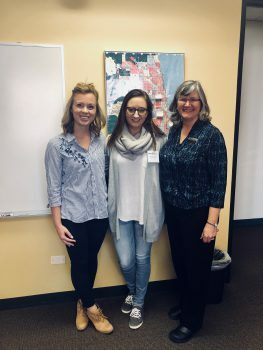 Getting to visit and share about my experience with potential future student teachers in the Chicago Semester Program was such a fun and fulfilling experience, as I got to give back to a program that has given me so much. The next four weeks will be busy as I begin to transition out of having full control of the classroom and prepare to hand the class back over to my cooperating teacher. Although I know how difficult this will be, I am confident that I have been well prepared to do this through the program. In addition there are a few items left that I hope to see in the last few weeks before I close this chapter of my journey, with one of these items being exploring the Hyde Park neighborhood. I look forward to these last few weeks and looking forward to sharing with you my final steps on this once in a lifetime opportunity.